Camilla Läckberg has provided this reader with another meaty read in this the tenth in the Patrik Hedström and Erica Falck. This story is lengthy and involved. Readers won’t be able to stop themselves remembering some real-life crimes, especially those involving child-killers with the most obvious inspiration being drawn from Anne Perry and her friend Pauline Rieper, not a comfortable subject at all. The main story is that set in the present day of the disappearance of four-year old Nea Berg from the same farm that another four-year old child went missing from thirty years before. Then Marie and her best friend Helen were accused of murder at the tender age of just thirteen. This is therefore in true Camilla Läckberg style a crime in the past with parallels in the present. What makes the disappearance of Nea Berg all the more chilling is that Marie Wall had returned to Fjällbacka in her role as Ingrid Bergman in a new film. Marie had used the crime she was accused of thirty years ago to help propel her into Hollywood stardom, and it had worked but she had not set foot back in the small Swedish town since she left all those years before. Helen meanwhile had married a local man aged eighteen and lived a quiet life now mother to a teenage son she is fearful that Marie’s return will encourage the story to come to life again. The chapters each cover many viewpoints each including scenes at the police station as our old favourites interview witnesses, pour over forensic reports and the ever dependable station chief Bertil Mellberg gives television interviews and interferes in Patrik Hedström’s handling of the case. As always it was great to catch up with everyone in Fjällbacka’s Police force and it does provide some much needed light relief in this dark and disturbing tale. Erica already had a book in the pipeline about Stella Strand and her two accused killers and so when parallels are drawn between the crimes she is on hand with her notes so far, and the interviews she continues to hold with key people from the time. Interspersed with the current investigations and happenings are chapters on The Stella Case giving the reader insights that haven’t necessarily been discovered, including those thoughts of the lead investigator. Intriguingly there is also a far older tale to be told that of Elin Jonsdotter in Bohuslän in 1671, what relevance this strand has remains a mystery for much of the book. If all that wasn’t enough the author includes another strand about Syrian refugees. I enjoyed this greatly although I was reminded why I normally save these novels as holiday reads; The Girl in the Woods is a whopping 592 pages long and packed full of information which doesn’t necessarily lend itself to short bursts of reading. For the first time in this series I did have moments where I wondered if the author had been slightly over-ambitious in the amount of different strands that run through the book, not that it was confusing, far from it, but the read felt far darker overall than the previous books in the series, and they were hardly laugh a minute reads. However, if you are a fan, as I am, there is much to feast on not only while you are reading this book but there are bigger themes and philosophical questions to ponder long after you finish the last page. 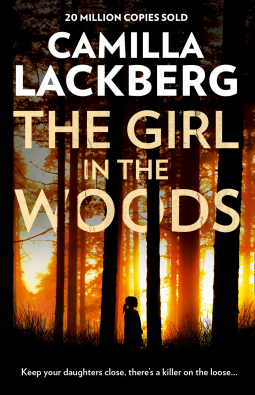 I’d like to say a huge thank you to HarperCollins UK who allowed me to read advance copy of The Girl in the Woods before publication on 22 February 2018. This unbiased review is my thanks to them. I like this series very much, too, Cleo. And this particular one looks especially good, with its multiple timelines and that film angle. Little wonder you enjoyed it as well as you did. Along with everything else, I like the setting for this series. It is a great series, I like the setting too and although I find some of the Scandi authors a little bleak in their outlook this author manages to get the ‘at home’ scenes to balance out any horrors in the plot very well. I really have this series on my list for this year – really! I definitely want to read it and am wondering if I should just try the whole thing on audio. That works so well for me, especially with series books that are a bit long and also a bit dense with other things. I could rotate with the Vera Stanhope books which I am also listening to on audio. 592 pages? I should plan this one for a holiday! Great review! I do normally read these on my holidays but I had this copy from NG – thank you Meggy! I need to try this series…the Swedish setting captures my interest, since my maternal grandparents grew up there…and I loved listening to my grandmother’s stories. Oh then this series would be perfect for you – they really are involved stories and there hasn’t been a ‘duff’ one as far as I’m concerned! Wonderful review and now I’m intrigued. This series could be a good one for me. Great review! This looks like a very interesting series. Definitely going to check it out!